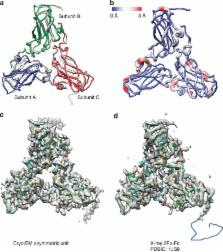 Recent developments in cryo-electron microscopy have enabled structure determination of large protein complexes at almost atomic resolution. Wang et al. combine some of these technologies into an effective workflow, and demonstrate the protocol by solving the atomic structure of an icosahedral RNA virus. UCSF Chimera--a visualization system for exploratory research and analysis. The design, implementation, and capabilities of an extensible visualization system, UCSF Chimera, are discussed. Chimera is segmented into a core that provides basic services and visualization, and extensions that provide most higher level functionality. This architecture ensures that the extension mechanism satisfies the demands of outside developers who wish to incorporate new features. Two unusual extensions are presented: Multiscale, which adds the ability to visualize large-scale molecular assemblies such as viral coats, and Collaboratory, which allows researchers to share a Chimera session interactively despite being at separate locales. Other extensions include Multalign Viewer, for showing multiple sequence alignments and associated structures; ViewDock, for screening docked ligand orientations; Movie, for replaying molecular dynamics trajectories; and Volume Viewer, for display and analysis of volumetric data. A discussion of the usage of Chimera in real-world situations is given, along with anticipated future directions. Chimera includes full user documentation, is free to academic and nonprofit users, and is available for Microsoft Windows, Linux, Apple Mac OS X, SGI IRIX, and HP Tru64 Unix from http://www.cgl.ucsf.edu/chimera/. Copyright 2004 Wiley Periodicals, Inc.
Atomic models by cryo-EM and site-directed spin labeling: application to the N-terminal region of Hsp16.5. Near-Atomic Resolution Structure of a Plant Geminivirus Determined by Electron Cryomicroscopy. Designer nanoscale DNA assemblies programmed from the top down.